Example of dust clouds imaged by ESA's Mars Express Visual Monitoring Camera and NASA's Mars Reconnaissance Orbiter's Mars Colour Imager (MARCI) in November 2007 over the Utopia region. Arrows indicate the dust front in each image. 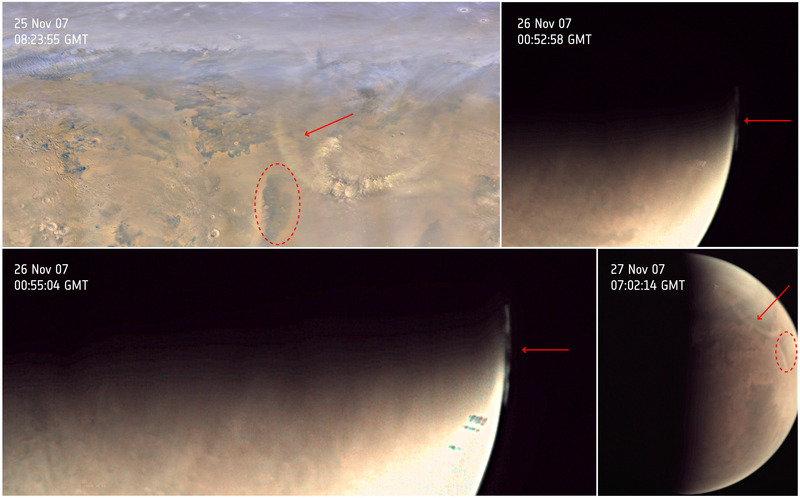 For the MARCI image (top left) and the VMC image at bottom right, a recognisable surface feature is marked on the image, aiding identification of the dust front in both images. The arced dust front had a length of 730 km on its internal edge and 1950 km on its outer arc, and a width of about 60–130 km. Limb observations by VMC indicated the altitude was about 65 km.